Segment makes it easy to send your data to Nudgespot (and lots of other destinations). Once you've tracked your data through our open source libraries we'll translate and route your data to Nudgespot in the format they understand. Learn more about how to use Nudgespot with Segment. Our CDN is updated within 5-10 minutes. If you are using Nudgespot for the first time, sign up and choose the ‘Segment’ option under Destinations on their ‘Getting Started with Nudgespot’ page. Once you reach the Segment onboarding page, click on the ‘Enable with Segment’ option. If you are already using Nudgespot, go to the ‘Settings’ page and click on the ‘Enable with Segment’ button. Nudgespot is supported on mobile, web browsers and on the server side. The first thing you’ll want to do is to identify your users so Nudgespot knows who they are. You’ll use the identify method to accomplish this - identify takes the unique user Id of a user, first name, and any other traits you know about them. When you call identify from any of Nudgespot’s server-side libraries, they’ll create or update the users in Nudgespot with the traits provided. You will see the traits appear as properties on any events you track. When you use Nudgespot, it’s important that you identify a user before you call track. A track without an identify won’t create a user. Nudgespot is a communication tool you can use to communicate with your users after you track their action (or inaction). The more events you track, the better Nudgespot will work for you. The Segment track method maps events and event properties directly to Nudgespot events and event properties. 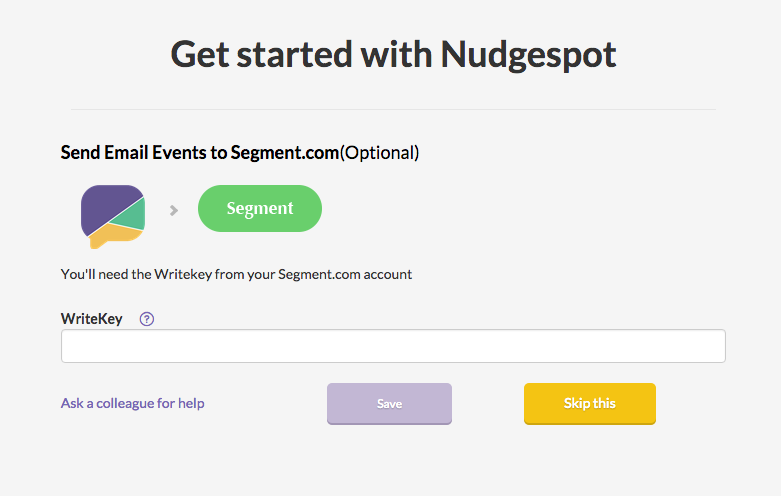 Nudgespot supports sending email events to other tools on the Segment platform. These events will be sent as track calls to the other destinations you’ve turned on. To enable this feature, enter in your Write Key when setting up your account. When will I see data from my mobile app? If you already have an app deployed with the Segment source, and you just turned on Nudgespot, it will take up to an hour for all your mobile users to refresh their Segment settings cache, and learn about the new service that you want to send to. After the settings cache refreshes, our source will automatically start sending data to Nudgespot.